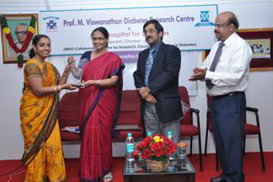 Prof. M. Viswanathan Honour Award event held on Saturday, 24th of December, 2011 at M.V.Hospital for Diabetes Auditorium Royapuram. Dr. Jamuna Prakash, Professor & Head, Department of Food Science and Nutrition, University of Mysore, Manasagangotri, Mysore is being conferred with Prof. M. Viswanathan Honour Award citation / plaque for her outstanding academic and research contributions towards the important aspects of food science and nutrition. 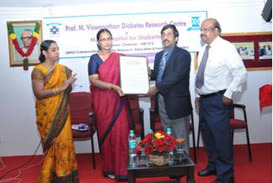 (Photo Left) Dr.Vijay Viswanathan, Managing Director, M.V.Hospital for Diabetes is presenting the citation to her. (Photo Right) Dr. A.J. Hemamalini, Head of the Nutrition Department, Sri Rama Chandra University (Left) is presenting the plaque to Dr.Jamuna Prakash (Right). 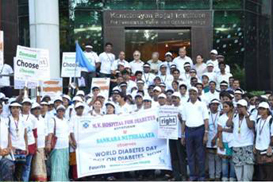 Dr.J.Nagarathnam, Chief Executive, M.V.Hospital for Diabetes is also seen. 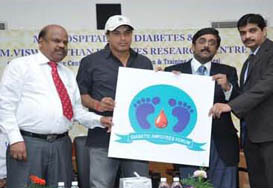 Mr. Robin Singh, Former Indian Cricketer, (2nd from Left) launching Diabetic Amputees Forum. 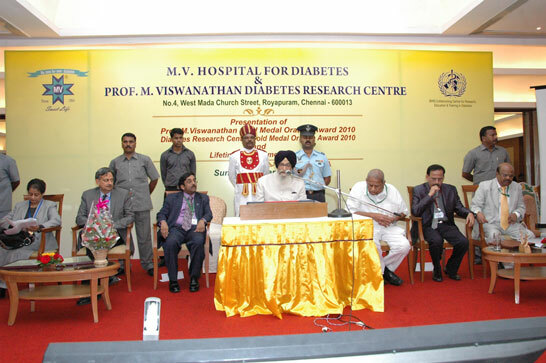 He is flanked by Dr.Vijay Viswanathan, Managing Director, M.V.Hospital for Diabetes (2nd from right), Dr. Uma Mahesh, Senior Diabetologist (Extreme Right) and Dr.J. 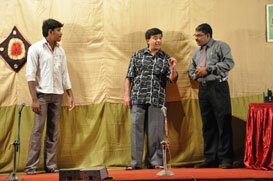 Nagarathnam, Chief Executive (Extreme Left). 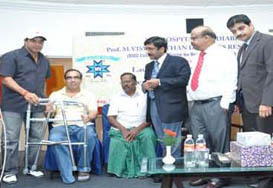 Photo (Right) Mr. Robin Singh distributing free walker to 20 Diabetic Amputees on this occasion. 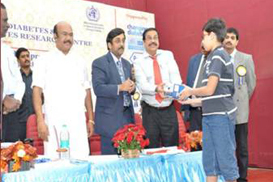 LAUNCH OF CHANGING DIABETES IN CHILDREN PROGRAMME (PROVIDING TOTAL DIABETES CARE TO UNDERPRIVILEGED CHILDREN IN TAMIL NADU) HELD AT PARZI CLUB, ROYAPURAM ON 12-11-2011. Thiru. D. Jayakumar Hon'ble Speaker, Tamil Nadu Legislative Assembly launching the project 'Changing Diabetes in Children in Tamil Nadu' supported by Novo Nordisk and Roche and giving away kits to first 5 children with diabetes. 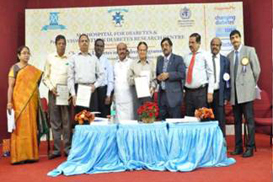 Hon'ble speaker is flanked by Dr.Vijay Viswanathan, Managing Director, M.V.Hospital for Diabetes (4th from right), Dr.K.Prakasam, President, Tamil Nadu Medical Council (3rd from right), Dr.N.Raja, Director of Medical and Rural Health Services, Govt. of Tamil Nadu (2nd from left). The event witnessed honouring CLRI scientists headed by its Director Dr. A.B.Mandal and his team and launching MOBI Health Monitoring System using MOBIPULSE first time in India. 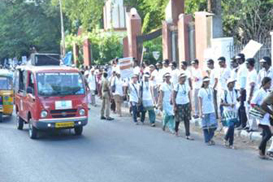 HUMAN CHAIN BY M.V.HOSPITAL FOR DIABETES ROAYPURAM AND SANKARA NETHRALAYA TO MARK WORLD DIABETES DAY HELD AT WOMEN'S CHRISTIAN COLLEGE, COLLEGE ROAD, NUNGAMBAKKAM ON MONDAY, 14TH OF NOVEMBER, 2011. 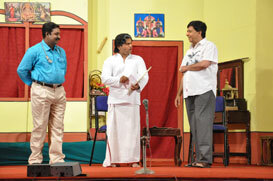 Cine Actor Mr.Prashant, Dr.S.S. 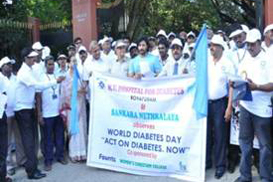 Badrinath, Chairman Emertirus, Sankara Nethralaya, Dr.Vijay Viswanathan, Managing Director, M.V.Hospital for Diabetes, Royapuram are leading the rally and they are seen holding flags behind the banner. 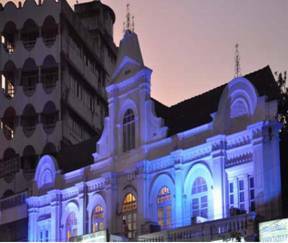 Historical building Higginbothams (Books Emporium) established in the year 1844 being lit with blue in honour of World Diabetes Day. 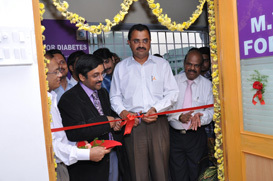 INAUGURATION OF M.V.CENTRE FOR DIABETES, BANASHANKARI, BANGALORE ON MONDAY, 19TH OF SEPTEMBER, 2011. 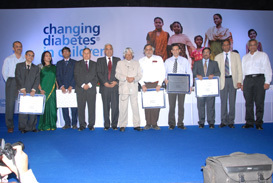 LAUNCH OF CHANGING DIABETES IN CHILDREN HELD ON WEDNESDAY, 7TH OF SEPTEMBER, 2011 AT CHOWDIAH MEMORIAL HALL, BANGALORE. 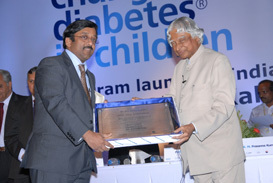 Dr.A.P.J.Abdul Kalam, former President of India honouring Dr.Vijay Viswanathan, Managing Director, M.V.Group of Institutions, Chennai in connection with the launch of changing Diabetes in children. Photo (R ) Dr. A.P.J. Abdul Kalam is with other medal recipients during the event. 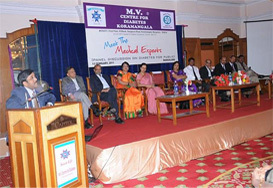 MVH staff with an unstinting years of service were honoured during the Founder's Day Celebration held on 26-08-2011. Photo above, awardees with Dr.Vijay Viswanathan, Managing Director, M.V.Group of Institutions. LAUNCH OF CHENNAI AMPUTATION PREVENTION SERVICE HELD ON TUESDAY, 2nd AUGUST, 2011 AT KINGSTONE HALL, GRT GRAND, CHENNAI. 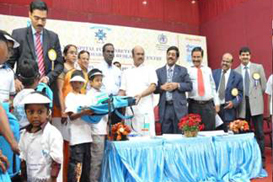 With the aim of creating awareness and providing education on amputation prevention among the diabetic population, we launched the Chennai Amputation Prevention Service (CAPS), an Amputation Prevention programme targeted exclusively at Diabetic Patients. The CAPS is facilitated with a specially designed vehicle in which a team of a Social Worker, a Nurse, a Physiotherapist and a Diabetes educator will travel conducting awareness camps in various parts of the city. The team will also attend to patients who have undergone amputation of one of their legs or a part of it to help them save at least the other leg at their doorstep through education on diabetes and the methods to prevent amputation. Foot examination and care, and dressing of the wounds will also be done in people with foot ulcers and advice will be given regarding appropriate footwear and referrals if needed. To get more information on this, a patient can call mobile No. 9840198880. 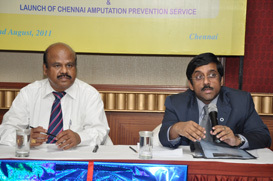 Dr.Vijay Viswanathan, Managing Director, M.V.Hospital for Diabetes (right) at the launch of Chennai Amputation Prevention Service. 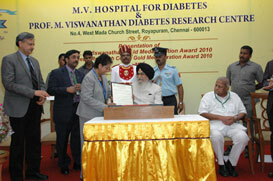 Dr.J.Nagarathnam, Chief Executive Officer, M.V.Hospital for Diabetes (left) is also seen. M.V. 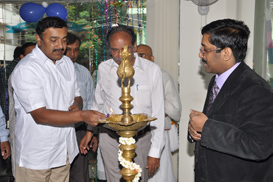 Ayurvedic Centre was inaugurated by Prof.Vijay Viswanthan, Managing Director, M.V.Hospital for Diabetes & Prof.M.Viswanathan Diabetes Research Centre in the august presence of Institute's staff on Wednesday, 27th of July, 2011 at 10.30 a.m. 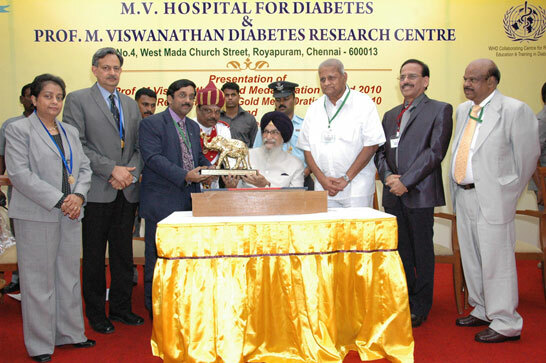 This centre is located at Royapuram and on the premises of M.V.Hospital for Diabetes. The objective of this centre is to provide ayurvedic massage for diabetics and non diabetics having pain on shoulder, neck, leg, foot and the whole body at a very nominal charge. The centre is equipped with highly qualified and expert massage therapists and other infrastructure for effective ayurvedic massage treatment. 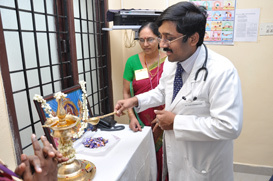 Dr.Vijay Viswanathan, Managing Director, M.V.Hospital for Diabetes inaugurating the M.V.Ayurvedic Centre by cutting the ribbon. 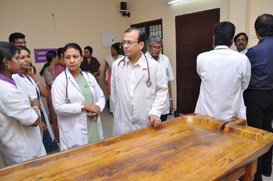 Dr.Uma Mahesh, Sr.Consultant on (Left) and Dr.J.Nagarathnam, Chief Executive of the Institute and other staff are seen. 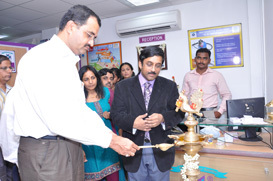 Dr.Vijay Viswanathan lighting the traditional lamp during the inauguration. Photo (above) doctors and staff of the Institute assemble M.V.Ayurvedic Centre at the time of inauguration and photo (right) massage therapist attends to a patient having pain on leg. The new centre (M.V.Centre for Diabetes, Perungudi) is being inaugurated by Thiru Sunil Paliwal, I.A.S., Managing Director, Tamil Nadu Road Development Company Limited. 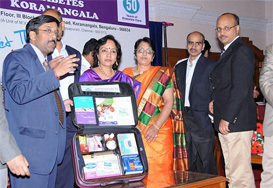 (Left) Dr.Vijay Viswanathan, Managing Director, M.V.Hospital for Diabetes looks on. Photo (Right) Dr.Vijay Viswanathan briefing Mr.Sunil Paliwal about new centre. 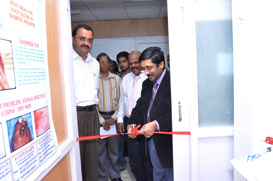 Dr.Vijay Viswanathan, Managing Director, M.V.Hospital for Diabetes inaugurates the new segment of Foot Clinic at the centre. (Left) Mr. Sunil Paliwal looks on. Photo (Right) Dr.Vijay Viswanathan briefing Mr.Sunil Paliwal (Left) about a special footwear (Diastep) designed for diabetics in technical collaboration with Central Leather Research Institute, Adyar. 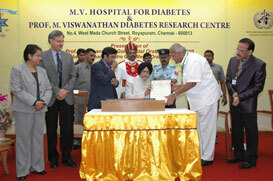 Dr. J.Nagarathnam, Chief Executive, M.V.Hospital for Diabetes is also seen in the picture. Thiru Sunil Paliwal, I.A.S. is lighting the traditional lamp as part of the center's inauguration. Dr.Vijay Viswanathan looks on. Photo (Right) Mr.Sunil Paliwal is watching a programme on Corporate Video Film highlighting the history of M.V.Hospital for Diabetes, Royapuram. Prof. M.Viswanathan Gold Medal Oration & Diabetes Research Centre Gold Medal Oration Awards for the year 2010 were held at Taj Connemara on Sunday 13th March, 2011 in the august presence of Shri Surjit Singh Barnala, His Excellency the Governor of Tamil Nadu and other invitees for the event. The orations were attended by more than 150 invitees. Scientific committee of the Diabetes Research Centre every year confers these awards on doctors with excellent research works in the field of medicine. Prof. M.Viswanathan Gold Medal Oration award for the year 2010 was conferred on Dr. Shanti Mendis, Adviser/Co-ordinator of the WHO cardiovascular program from 2000. Diabetes Research Centre Gold Medal for the year 2010 was conferred on Dr. Shiv Kumar Sarin, Chairman, Board of Governors, Medical Council of India. The scientific meeting was witnessed honouring an eminent scholar in Medicine with Life Time Achievement Award 2010. Dr. Sengamedu Srinivasa Badrinath, Chairman, Emeritus, Sankara Nethralaya was the recipient of this Award. Shri. 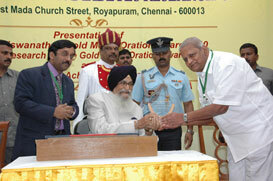 Surjit Singh Barnala, His Excellency the Governor of Tamil Nadu presented Lifetime Achievement Award – 2010 citation and a plaque to Dr. Sengamedu Srinivasa Badrinath, Chairman, Emeritus, Sankara Nethralaya for his selfless service in the filed of Ophthalmic care and relentless dedication to building an Institution par excellence in Eye Care. Dr. Vijay Viswanathan, Managing Director, M.V.Hospital for Diabetes is seen on the left of His Excellency the Governor of Tamil Nadu along with other dignitaries on the dais. Shri. 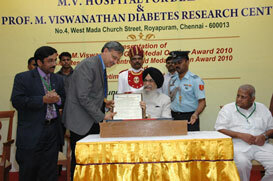 Surjit Singh Barnala, His Excellency the Governor of Tamil Nadu presented Prof. M. Viswanathan Gold Medal & citation to Dr. Shanti Mendis, Adviser/Co-ordinator of the WHO cardiovascular program from 2000 & Diabetes Research Centre Gold Medal & Citation to Dr. Shiv Kumar Sarin, Chairman, Board of Governors, Medical Council of India. Shri. Surjit Singh Barnala, His Excellency the Governor of Tamil Nadu is addressing the gathering after the presentation ceremony. The medal recipients and other dignitaries are seen on the dais. 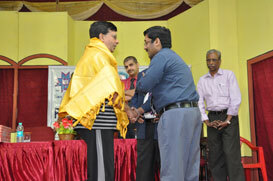 Dr. Vijay Viswanathan (on the left) presented a Memento to Shri. Surjit Singh Barnala, His Excellency the Governor of Tamil Nadu. He is flanked by the medal recipients and other dignitaries on the dais. 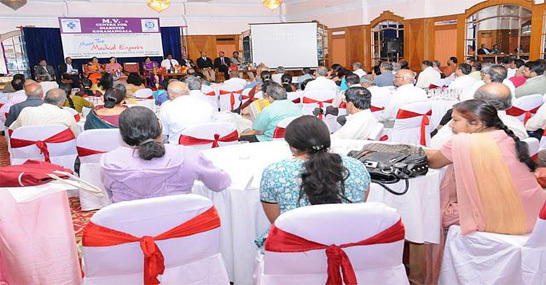 MEET THE MEDICAL EXPERTS (PANEL DISCUSSION ON DIABETES FOR PUBLIC) ORGANIZED BY M.V.CENTRE FOR DIABETES, KORAMANGALA AT CAPITOL HOTEL BANGALORE ON SUNDAY, 13th FEBRUARY, 2011. Dr. Kamini A. Rao releasing the Diabetes Self Care Kit. She is flanked by Dr Vijay Viswanathan, Managing Director, M.V. Group of Institutions (Extreme Left) and other medical experts. 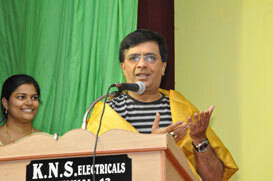 (Photo Right) Dr.Vijay Viswanathan is addressing the gathering. Photos below medical experts and the audience. 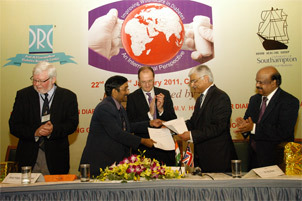 Wound Care in Diabetes – An International Perspective – Signing of MoU with Southampton University held at GRT Convention Centre, Chennai from 22/01/2011 to 23/01/2011. Photo above exchanging of documents after signing the historic MoU with University of Southampton. (Left) Dr.Vijay Viswanathan, Managing Director M.V.Hospital for Diabetes & Prof. M.Viswanathan Diabetes Research Centre Royapuram and (Right) Prof. Raj Mani, Faculty of Medicine and Health and Life Sciences, School of Medicine, University of Southampton, UK. (Centre) Mr. Mike Nithavrianakis, British Deputy High Commissioner, Chennai looks on. Extreme (Left) Prof. Finn Gottrup, Professor of Surgery, University of Southern Denmark, Copenhagen Wound Healing Centre, Copenhagen, Denmark & extreme (Right) Dr. J. Nagarathnam, CEO of the Institute are seen. Organisation and participation of joint academic and scientific activities such as seminars and conferences. Research papers resulting from this collaboration will give credit to participating members from both sides in accordance with good research practice.